The formal organization of the Murphy Presbyterian Church began with ten members when the building was dedicated September 1, 1896. The sanctuary has been in constant use for 118 years. The church does not any longer have members belonging to the original ten families who first met in a small building on the river under the leadership of James David Abbott. Land on Valley River Avenue, across from Mr. Abbotts home, was donated to the group and with $100.00 from the riverside property, plans for a sanctuary began to seem more than a dream. Under the leadership of the Rev. Siler $1,500.00 was accumulated and the building went on so that the dedication service could take place on September 1, 1896. Wooden pegs secured the joists and hand-dressed shingles covered the roof. Mr. Abbott realized the night before, that the church still owed Bob Ramsey 25 cents and he had told the Presbytery that the church was debt free. Therefore Mr. Abbott walked three miles both ways so that his word would be true. Although Rev. Mr. Siler helped build the church, the Rev. 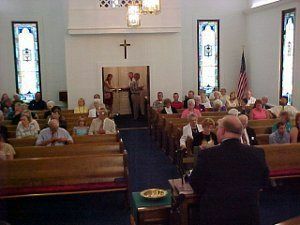 Robert S. Brown was the pastor at the dedication ceremony, and he served for one year. 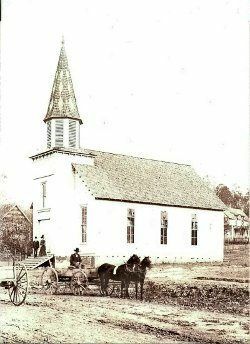 During the years from 1899 onward, the church, according to Rev. Mr. Robert A. Potter’s history, was “only occasionally supplied, and work sagged.” Pastors served for one to three months and Murphy shared pastors with Andrews, Bryson City, and sometimes Hayesville and Robbinsville. Church elders with Presbytery Home Missions help held the church together with student workers and temporary pastors. In 1917 to 1919, for example, Dr. Charles Morris came twice a month to fill the pulpit. The Mission Board helped keep the church going with financial aid and supply ministers until 1953, when the church became self-supporting. The church reached stability when Robert Potter served as pastor from 1955 until 1968. In 1921, with fifty members, the church built a manse behind the sanctuary. Now the former manse, called the Westminster Building, serves as the fellowship hall and classrooms. In 1948, aided by money bequeathed by Mrs. Nettie Dickey, an educational annex provided a chapel, three offices, a library, a classroom, and two rest rooms, and connected with a corridor to the Westminster Building. In 1953, the brick veneer project gave the facility a new look. Remodeling the sanctuary included removal of the balcony, so the bell tower can only be reached by ladder, and addition of a portico. The large stained glass window at the front of the sanctuary is dedicated to the memory of Isabella Abbott Davidson, whose father, J. D. Abbott donated the present church property and was the driving force to establish the church. Other stained glass windows honor early church leaders, including Dr. Robert Perry Smith, who resigned as president of Presbyterian College to ride horseback over the mountains to found orphanages, schools, and churches as an Evangelist for the Home Missions Committee. He founded our church and the one in Andrews. Early mayors of Murphy included elders Marshall Bell, John H. Dillard, and Donald Witherspoon (he donated his salary as mayor to pay for the Carnegie Library’s first librarian). George Candler served as town clerk. Donald Witherspoon and John H. Dillard also were North Carolina Representatives. Alan Wildsmith came straight from seminary in 1983, and has served as pastor for thirty-one years. As Chaplain for the Cherokee County Sheriff’s Department, he ministers to deputies and prisoners, and helped found the national award winning Victim Advocate program. The two adult Sunday school classes and children’s classes offer educational opportunities, as do the Women’s Circle and Men’s Group study groups. Elders are active in Evangelical Presbyterian Church Presbytery and General Assembly meetings, studies, and occasional visiting speakers present vivid pictures of missions. Fellowship opportunities include the monthly church pot-luck luncheons, the annual Hanging Dog picnic, Caroling and Cookies celebration. The church now has 60 members, about 20 other attending regulars, and a host of summer residents. We look forward to continue serving Christ and our community.